The term jaundice is derived from the French word jaune, which means yellow. Jaundice is not a disease per se, but rather a visible sign of an underlying disease process. Jaundice is typically seen when the level of bilirubin in the blood exceeds 2.5-3 mg/dL (milligrams per deciliter). 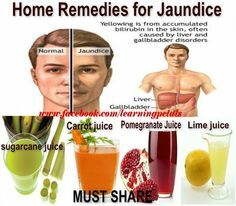 Jaundic , also referred to as icterus, is the yellow staining of the skin and sclerae (the whites of the eyes) by abnormally high blood levels of the bile pigment, bilirubin. The yellowing extends to other tissues and body fluids and also may turn the urine dark. Yellowing of only the skin also can be caused by eating too many carrots or drinking too much carrot juice. Jaundice is the medical term that describes yellowing of the skin and eyes. This condition forms when there is too much bilirubin in your system. Bilirubin is a yellow pigment that is formed by the breakdown of dead red blood cells in the liver. Normally, the liver gets rid of bilirubin along with old red blood cells. Jaundice may indicate a serious problem with the function of your liver, gallbladder, or pancreas. Yellow-tinted skin and eyes characterize jaundice. In more severe cases, the whites of your eyes may turn brown or orang-colored. You may also have dark urine and pale stools. If an underlying health condition such as viral hepatitis is to blame for the jaundice, you might experience other symptoms, such as excessive fatigue and vomiting. Some people misdiagnose themselves when they experience yellow skin. According to the Merck Manuals Consumer Version, patients who have jaundice usually have both yellow-colored skin and eyes. If you only have yellow skin, it’s more likely due to having too much beta-carotene in your system. Beta-carotene is an antioxidant found in carrots and pumpkins. An excess of this antioxidant is not a cause of jaundice. Old red blood cells travel to your liver, where they’re broken down. Bilirubin is the yellow pigment formed by the breakdown of these old cells. 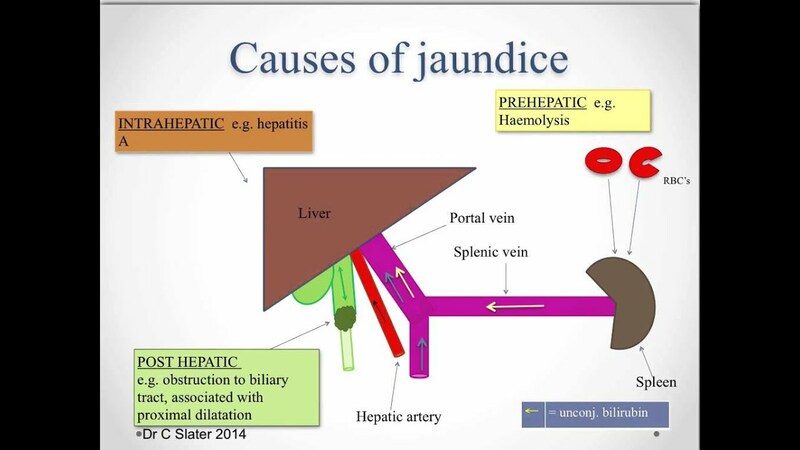 Jaundice occurs when your liver doesn’t metabolize bilirubin the way it’s supposed to. Your liver might be damaged and unable to perform this process. Sometimes, the bilirubin simply can’t make it to your digestive tract, where it normally would be removed through your stool. In other cases, there may be too much bilirubin trying to enter the liver at once, or too many red blood cells dying at one time. Jaundice is also a frequent occurrence in newborns, especially in babies who are born prematurely. An excess of bilirubin may develop in newborns because their livers haven’t fully developed yet. Your doctor will first conduct blood tests to determine the cause of your jaundice. A blood test can not only determine the total amount of bilirubin in your body, but it can also help detect indicators of other diseases such as hepatitis. The severity of jaundice in newborns is generally diagnosed with a blood test. A small blood sample is taken by pricking the infant’s toe. Your pediatrician will recommend treatment if the results indicate moderate to severe jaundice. The type of treatment your doctor recommends for jaundice depends on the underlying cause. Mild cases may go away without treatment. However, severe cases can eventually damage the brain. Your doctor will treat the cause of the jaundice, not the symptom itself. Once treatment begins, your yellow skin will likely diminish. According to the American Liver Foundation, most jaundice cases in infants resolve within one to two weeks. Moderate jaundice is typically treated with phototherapy (light therapy) in the hospital or in the home to help remove excess bilirubin. The light waves used in phototherapy are absorbed by your baby’s skin and blood. The light helps your baby’s body change the bilirubin into waste products to be eliminated. Frequent bowel movements with greenish stools are a common side effect of this therapy. This is just the bilirubin exiting the body. Phototherapy may involve the use of a lighted pad, which mimics natural sunlight and is placed on your baby’s skin. Severe cases of jaundice are treated with blood transfusions (injections of donor blood) to remove bilirubin. Jaundice usually clears up when the underlying cause is treated. Outlook depends on your overall condition. See your doctor right away to improve your chances of a quick recovery. Mild cases of jaundice in newborns tend to go away on their own without treatment, and cause no lasting liver issues.